"I don't even let my dogs drink this water"
FLINT, Mich. -- Less than an hour's drive from one of Earth's great fresh water sources, some people in Flint are searching for a drop worth drinking. Since the financially struggling city broke away from the Detroit water system last year, residents have been unhappy with the smell, taste and appearance of water from the city's river as they await the completion of a pipe to Lake Huron. They also have raised health concerns, reporting rashes, hair loss and other problems. A General Motors plant stopped using the water, saying it was rusting its parts. Officials say recent state tests show the water meets federal safety guidelines, and the city will be better off free of the leviathan Detroit system once the pipeline is complete by 2016. And while many Detroit suburbs have long dreamed of breaking their dependence on the city's water, further-away Flint is the first to risk it - and test whether the potential savings are worth going it alone. "Unfortunately, some of our problems aren't quickly or easily solved," said Jerry Ambrose, Flint's state-appointed emergency manager, adding that the "challenges" resulting from the temporary reliance on the river "were greater than we expected." "The potential to leave (Detroit) was well-supported by a business case, and in the long-term will benefit this region as well as the city of Flint," Ambrose said. While there won't be "magical reductions" in rates, he said, cost increases should be much less. 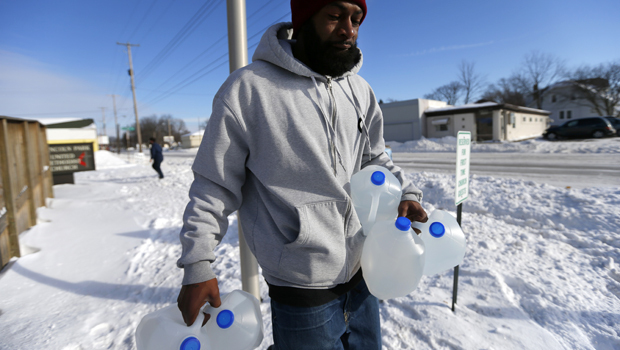 Flint had long chafed at the Detroit Water & Sewerage Department's rising prices. Flint officials estimated the cost of buying water from Detroit this year at $16 million, and the overall annual cost of switching to the new Karegnondi Water Authority would be $12.5 million. Still, the long-discussed divorce has brought real and figurative headaches. Tests released last week show the water is safe, but complaints from residents persist. They say the water looks brown or rusty, and tastes and smells of chlorine. People have protested at council meetings, held community hearings, hosted water giveaways and marched through downtown. Facebook pages have been forums for complaints and concerns. Last month, the county started distributing bottled water to about 1,300 preschool students and a children's museum recently blocked access to water fountains, citing Safe Drinking Water Act violations because of high levels of a disinfectant byproduct. High bacteria levels forced boil-water advisories last year. Resident Tony Palladeno Jr., 53, said he gets bottled water from a grocery store or spring water from his cabin further north, but uses city water for showers. "No matter what, if I go in, one time it's going to be my eyes, or I'll get headaches or my lungs," he said, adding that he's lost hair and produces a bottle of it to illustrate. "People say, 'Oh, it's paranoia.' No. ... I'm living this." Palladeno, who considers his city "a guinea pig," and others are angered by the decision to let the GM Engine Plant stop using Flint water and link with a township that gets water from Detroit. The move could cost the city about $400,000 per year in lost revenue. Rick Holtstander boiled his tap water at first, but says he rubbed his finger around the inside of the pan and picked up "something that looked just like cigarette ash." "I don't even let my dogs drink this water," he said as he collected four gallons at a recent water giveaway. Activists have urged Flint to return to Detroit's system, which has offered to reconnect the city at last year's rates. Other Detroit water customers are watching how the situation unfolds. Between Flint and Detroit sits Oakland County, where County Executive L. Brooks Patterson has often spoken about mismanagement in Detroit's system. He has in the past has explored building a separate water and sewer structure, and has celebrated efforts to create a regional Great Lakes Water Authority to take over operations of Detroit's water system. Before a judge mediating the negotiations imposed a gag order, Patterson expressed concerns about raising enough revenue. Patterson also has said he didn't see a sound business case for Flint's solo plans, and cited an analysis that losing Flint-area customers would leave those remaining in Detroit's system with higher bills. Flint's troubles underscore the challenges any major water customer with similar designs could encounter, said Nick Schroeck, executive director of the Great Lakes Environmental Law Center at Wayne State University. The main obstacle is the cost, he said, and water and sewer projects aren't attractive to investors. "Maybe, economically and long-term, this will make sense for Flint and Genesee County, but that remains to be seen," he said. "As a region, I think we're better when we're working together and sharing resources. ... We're tied together for better or worse through our natural resources."